First and foremost, these courses and workshops are German language classes for adults. Our first aim will always be to work on the German language. We will simply use music, where appropriate, to support our efforts to learn vocabulary, grammar and pronunciation. We can listen to songs that contain the grammatical structures we are working with, talk about the rules and use the grammar in converstaion. If it turns out that you find particular words or structures difficult to memorise, we can work with rhythm. We might write new lines to songs or we can use music to relax while listening to verb forms. If you wish, we can also do some singing but there will be no pressure to do so! Our main focus is always on the German language and music will only be used where it supports the process of learning the language. 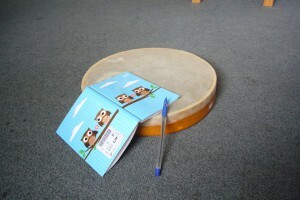 Recent research on music therapy has shown that when processing language together with rhythm or music, more areas of our brain are involved than when we process language on its own. This can support the process of language learning and help us retain information more easily. These courses and workshops are suitable for people who have an interest in music and would like to try a different approach to learning German. They are also suitable for people who have found language learning difficult in the past and would like to try another method. No particular musical skills or training are required. We work in small groups of no more than six participants. The courses and workshops are open to men as well as women.